A new space era is dawning and will be upon us by the early 2020s. In the face of emerging novel threats and vulnerabilities, whether the self-defense doctrine allows us to counter the threat before the attack occurs can make the difference between peace and war. Indeed, most of the national security provisions, which are the focus of this article, are only different in rhetoric but not in substance from those of the Obama administration and it’s predecessors. However, that they are the same is fine because they are equally essential for the new space era. Yet there is a critical difference in the self-defense doctrine. The new strategy declares “We will strengthen U.S. and allied options to deter potential adversaries from extending conflict into space and, if deterrence fails, to counter threats used by adversaries for hostile purposes.” Countering threats means we have the right to exercise self-defense when the threat is imminent but before the attack has occurred. The 2011 National Security Space Strategy of the Obama administration says “the United States will retain the right and capabilities to respond in self-defense, should deterrence fail.” It is not surprising that the self-defense doctrines of all previous administrations are the same, because they are rooted in Article 51 of the United Nations Charter: “Nothing in the present Charter shall impair the inherent right of individual or collective self defence if an armed attack occurs against a Member of United Nations.” It has long been known that Article 51 and our space strategies derived from it are ambiguous whether we have the right to counter with self-defense before an attack occurs. This ambiguity might even be advantageous for maximizing flexibility in our responses to attacks and threats. To understand why “counter threats” must be unambiguously included in self-defense, we need to see that space is entering into a new era where unmanned rendezvous and proximity operations will be prevailing and that the ambiguous self-defense doctrine we have followed since the dawn of space age must change. 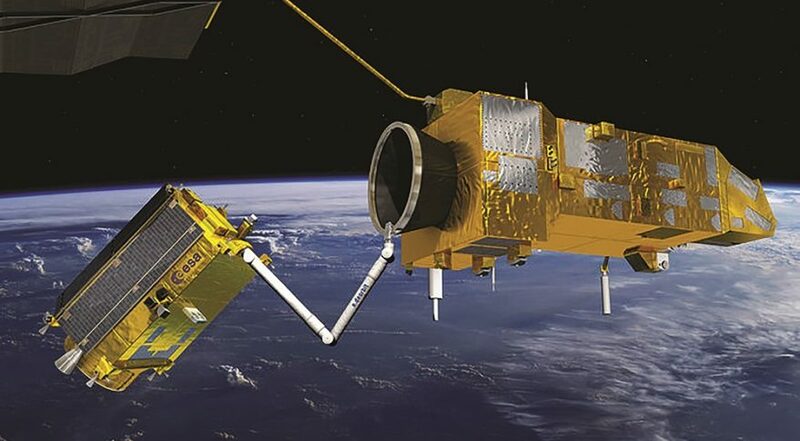 China has been developing special spacecraft for two purposes, which are supposedly “100 percent peaceful,” and these spacecraft will be deployed by the early 2020s. The U.S., European Union and Russia are also planning to do the same in a similar timeframe. The first purpose is to remove excessive space debris so that satellites can avoid accidental collisions with them. The second purpose is to refuel, repair and upgrade other satellites already in orbit. To perform these functions, these spacecraft are required to maneuver and stay very close and even use a robotic arm to grab onto space debris or a satellite being serviced. Alarmingly, the very same spacecraft can also be used to grab satellites and destroy them. Let’s consider a scenario where China threatens a space Pearl Harbor. Currently, China can legitimately tailgate or stalk very closely multiple critical U.S. satellites. The U.S. will not have enough time to save them from such near-simultaneous, close-up attacks. Thus, stalking presents the U.S. with two bad choices. First, the U.S. could preemptively destroy these space stalkers. However, without discussing the sensitive issue of preemption with other countries in peacetime well before the conflict, the U.S. will be seen as the aggressor that started a war in space that perhaps spreads to Earth, defeating every side’s original goal of avoiding a war. Second, the U.S. could delay self-defense until those targeted satellites had been destroyed by these space stalkers. But without these satellites’ support, the U.S. would fight poorly and even failingly. Facing these two unviable choices, the U.S. might end up not intervening at all. Unfortunately, failure to intervene would destroy the American alliance system. As to China, deterring U.S. intervention without firing a shot is the perfect outcome that irresistibly tempts it to threaten us with stalking in the first place. To counter the emerging threats from these dual-use spacecraft as well as traditional and other new threats, the U.S. should initiate the pursuit of a space arms control treaty based on two principles. First, the country that stalks more than an agreed number of satellites is defined as the aggressor. Second, as the new self-defense doctrine explicitly includes the prerogative to counter threats, the country being stalked now has the right to negate the imminent threat and defend itself before the attack begins. However, should such a multilateral treaty go nowhere, the U.S. should promptly turn to a unilateral solution following the same two principles. My two papers: the newly published Space Arms Control: A Hybrid Approach and Stalkers in Space: Defeating the Threat published in 2017 have suggested specific defensive measures and space arms control provisions. They can help both the United States and the international space community put flesh on the new self-defense doctrine for keeping peace in the emerging space era. For the last 50 years, the world has failed to arrive at a space arms control treaty, because Russia, China, and many other countries have been pursuing an impossible dream of banning the placement of any weapon in space. As these dual-use spacecraft will soon be needed, they cannot be banned. Once all countries realize weapons in space will soon be unavoidable and irreversible, they can unite to find a new solution based on this new and proper self-defense doctrine. As the new threats are only several years away, let us begin now a promising journey to keep peace in space.